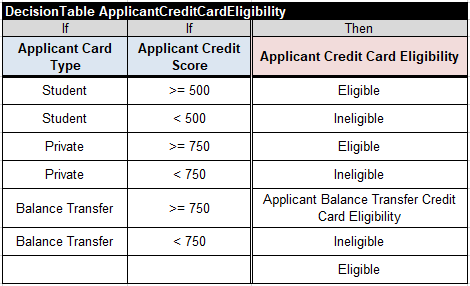 The latest June-2018 DMCommunity Challenge”Credit Card Application” gives me a good chance to demonstrate the new upcoming OpenRules Release 7.0.0. I remember that Nick Broom was one of the first who published a real-world decision model right after the DMN introduction. I also remember that at the same day I implemented and published Nick’s model using only Excel and OpenRules available at that time (it was release 6.2.6). It would be interesting to compare this old implementation with a new one below that takes advantages of new OpenRules-7. For simplicity of references, here are the links to Nick’s business process and DRD (DMN Decision Requirements Diagram). DRD as a top-level graphical representation of a DMN-based decision model can be very useful to visualize the model, however it quickly becomes messy for relatively large decision models. The mess is mainly caused by necessity to represent complex relationships between decisions, sub-decisions and decision tables using DRD’s arrows which may intersect. 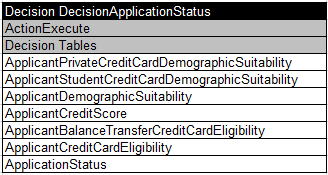 Last year in the post “Defining DMN Knowledge and Information Requirements Automatically” I explained that it is not necessary for a human modeler to define all those arrows-requirements: they can be defined automatically when all decision tables (BKMs) are already specified! 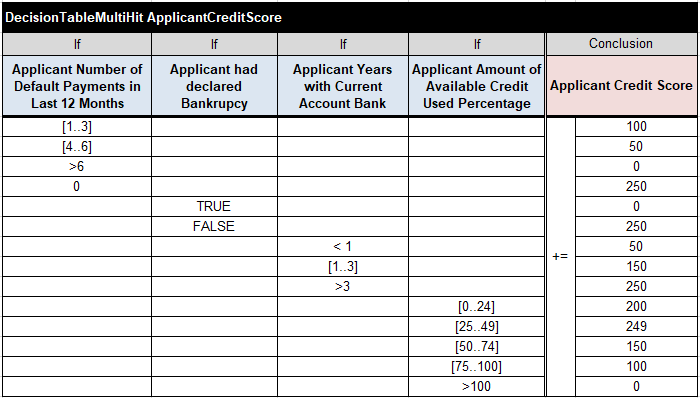 OpenRules-7 does exactly that essentially simplifying the decision modeling process. This hierarchy defines key decision variables which should be calculated by decision tables (or other BKMs) in the top-down fashion. 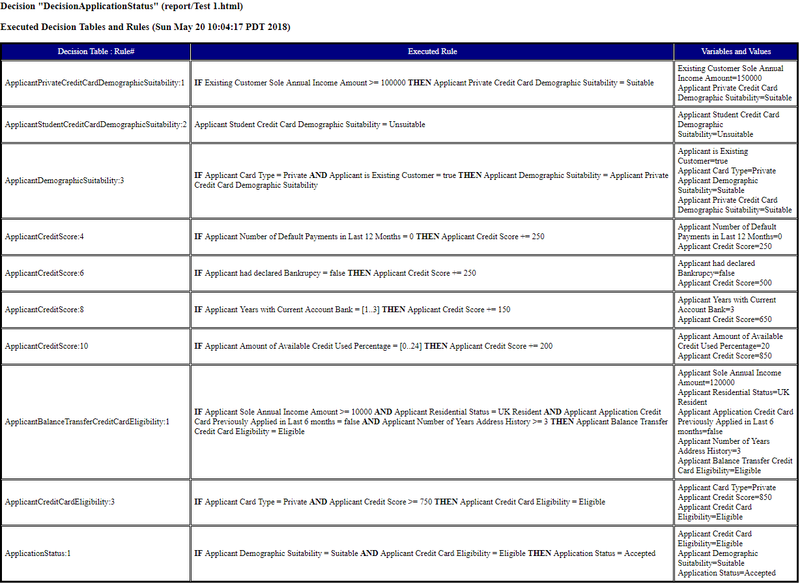 For example, on the top-level we need a decision table that defines Application Status as Accepted or Rejected. I added the variable Application Status as it corresponds to Nick’s business process. 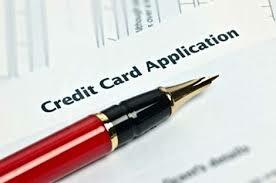 This decision variable depends on two other decision variables: Applicant Demographic Suitability and Applicant Credit Card Eligibility. 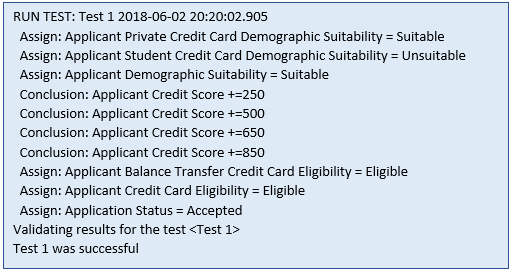 Then we need to construct a decision table that calculates Applicant Demographic Suitability using variables Applicant Private Credit Card Demographic Suitability and Applicant Student Credit Card Demographic Suitability, etc. When all decision tables are constructed, OpenRules-7 will find a way to correctly execute the decision model without forcing a user to manually provide arrows that define “who should be executed after whom” and “which data to be used”. CONCLUSION. 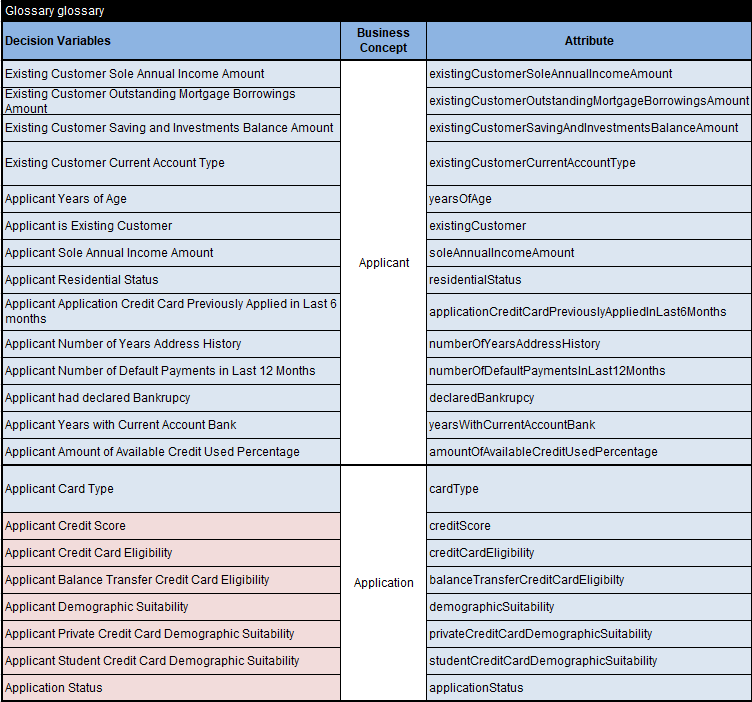 The new OpenRules release 7.0.0 allows a business analyst to concentrate of defining business logic and its tests and not to worry about the execution order or knowledge/ information requirements presented with DRD’s arrows. OpenRules users will especially appreciate the ability of OpenRules-7 to automatically generate an execution path if they compare the described decision model with the old one: many unnecessary decisioning constructs simply disappeared. P.S. I’d like to clarify that DMN DRDs are very helpful decision constructs especially if you create them using such graphical tools such as Trisotech DMN Modeler or DecisionsFirst Modeler and associate a lot of useful information with different decision nodes. But these decision modelers similarly to OpenRules should be able to automatically define all arrows (such as knowledge requirements) or at the very least they may validate the arrows manually drawn by a user as more decision tables (BKMs) become implemented. P.S.S. Making DMN knowledge and information requirements optional will also essentially simplify the DMN interchange format and its interpretation by different execution tools.